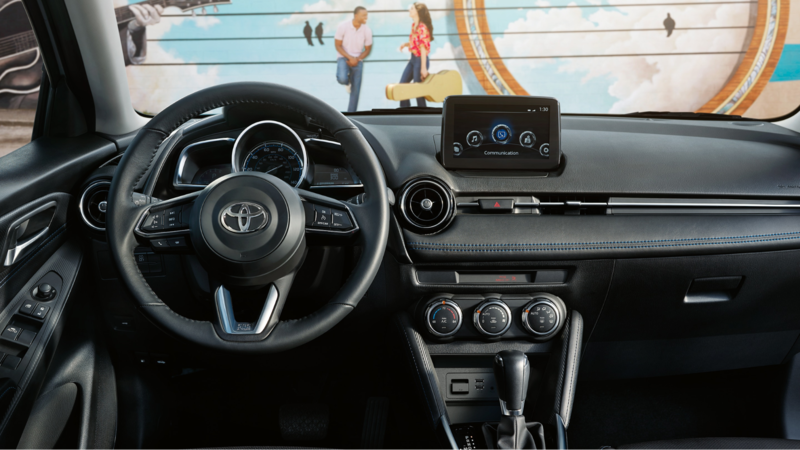 Perfect for making the most of your weekend, the fun-to-drive Toyota Yaris packs plenty of efficiency to take you further along with cutting-edge tech features to keep you connected. A surprisingly-spacious cabin lets you load up your whole crew for a night on the town. While it’s name might have changed from Yaris iA to Yaris, this smart sedan delivers responsive performance to help stretch your MPG. 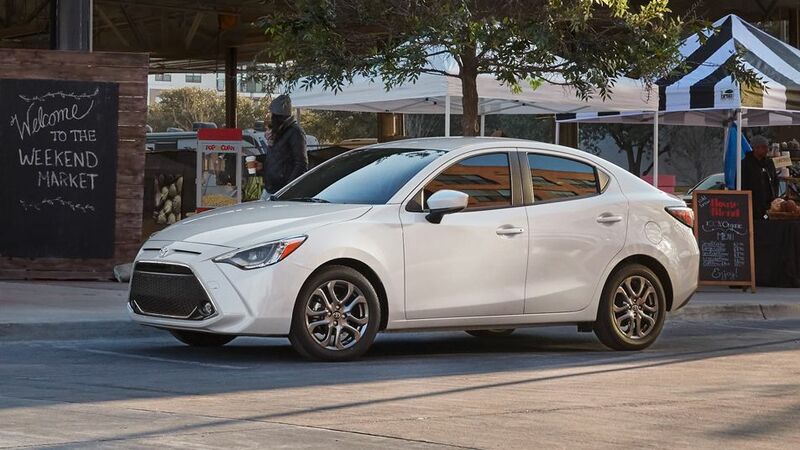 In fact, it’s lightweight body construction combined with an EPA-estimated 40 MPG on the highway** proves that the Yaris is an ideal companion for extended road trips. Features like an available Smart Key System with Push Button Start, automatic climate control, and two USB ports with MP3 connectivity highlight the exceptional value found on every Yaris model. From the sporty L, nicely-equipped LE, or the premium XLE — there’s a Toyota Yaris to suit every type of driving style. For 2019, the Toyota Yaris loses the “iA” designation in its name. 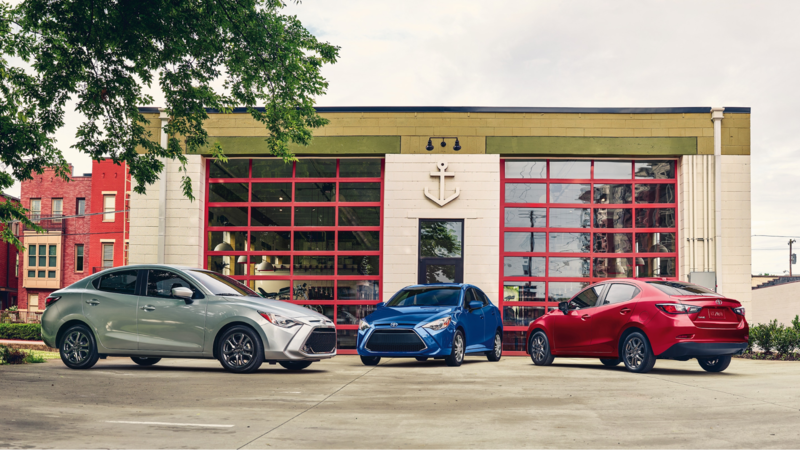 Formerly only available in a single trim level, the 2019 Yaris is now offered in your choice of three trim levels including L, LE, and XLE. A slight styling refresh includes a new front honeycomb-style grille for a more eye-catching look and optional LED headlights. Reflecting a personality as unique as your own, the Yaris comes standard with a race-inspired honeycomb-style front grille. Optional features found on the exterior include 16-inch alloy wheels, LED headlights, and heated power side mirrors with LED turn signals. Complementing its good looks, the Yaris packs efficient performance from a standard 1.5-liter 4-cylinder engine. Available with your choice of a 6-speed manual or 6-speed automatic transmission, the Yaris is able to deliver up to 40 MPG on the highway**. An optional Sport Mode switch lets you customize your drive. A standard MacPherson strut front suspension and torsion beam rear suspension combine to produce a perfect balance of agile handling and a smooth ride. Surround yourself with style and substance inside the tech-focused interior of the Toyota Yaris. Giving you the ability to carry even your biggest toys, the Yaris comes standard with 60/40 split folding rear seats. Optional leatherette seating surfaces feature unique contrast stitching for a stylish look and maximized comfort. Piano-black interior accents surround the center console and air vents, giving the entire cabin a more upscale feel than most compact sedans. A standard 7-inch touchscreen multimedia system is your centralized location for music and infotainment. Available automatic climate control lets you set it and forget it for a comfortable temperature on every drive. Safety no longer has to be a luxury feature thanks to the Toyota Yaris. A standard Low-Speed Pre-Collision System monitors the road ahead for potential collisions. If it detects a potential collision, the driver will receive an audio/visual alert followed by automatic braking assistance. Giving you even more confidence is a standard Active Safety System. 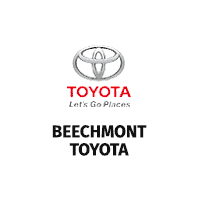 This collection of technologies includes Dynamic Stability Control (DSC), Anti-Lock Brake System (ABS), Brake Override System (BOS), Electronic Brake-force Distribution (EBD), Brake Assist (BA), and a Traction Control System (TCS). Optional rain-sensing windshield wipers provide excellent visibility during nasty weather conditions. **2019 EPA-estimated 32 city/40 highway/35 combined mpg for Yaris with automatic transmission. Actual mileage will vary.